MLB Kansas City Royals Metal Chrome License Plate Frame Auto Truck Car. Condition is New. Shipped with USPS First Class Package. Durable Acrylic Mirror. Indoor or Outdoor. Very sharp looking! Kansas City Royals. Novelty Sunglasses. Condition of Item :New. These are neat! 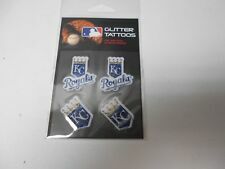 Item up for sale: You will get a Kansas City Royals Glitter Tattoos. Easy Application, no water needed. Safe and gentle on skin. Water resistant. Condition of Item :New. These are pretty neat! We will rectify the problem! You will receive a Kansas City Royals Forever Car Window Flag. Gold Pole. Approximatley 15" x 11". Printed Both Sides. Very, very nice. Kansas City Royals Forever. Window Car Flag. 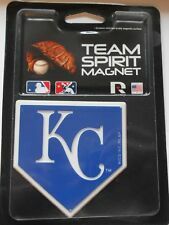 Item up for sale: You will get a Kansas City Royals Team Spirit Magnet. About 3" x 3". Emblem attaches to any magnetic surface. We will rectify the problem! Condition of Item :New. Very sharp looking. We will rectify the problem! DIE-CUT VINYL DECAL WITH BACKING Logo is cut to shape set on a 5.75"x7.75" rectangle (pictured.) Since all team logos are different shapes, all logos will be different sizes. Rico provides quality licensed goods made of the highest quality materials. This is a 12" x 30" full size pennant saluting the Kansas City Royals as 2015 World Series Champions. Embossed with your Favorite Team Logo. THIS IS A NEW MLB KANSAS CITY ROYALS REUSABLE STATIC CLING JUMBO DECAL. TEAM: KANSAS CITY ROYALS. REUSABLE STATIC CLING DECAL. SIZE: DECAL SHEET IS 18" X 12", ACTUAL LOGO IS 13" X 11". Flag attaches easily and securely to a car window. Kansas City Royals Car Flag. 2-Sided Flag. Rico Triple Spirit 3 pack cut to shape vinyl decals for indoor/ outdoor use. This is a great item for any Royals fan at a low price! Leather Trifold Wallet. Kansas City Royals. (Buying more than one wallet?. The features of the wallet include "Baseball Glove Leather". Made of a very soft leather used in the making of baseball gloves. ). Leather Bifold Wallet. This is a great item for any Royals fan at a low price! 2015 World Series Champions. Team logo and "2015 WORLD SERIES CHAMPIONS" logo are embossed on the top flap. Buying more than one wallet?. Nylon material suitable for indoor or outdoor use. Single-sided bold colors and vibrant graphics. Nylon TriFold Wallet. Kansas City Royals. 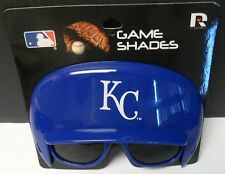 This is a great item for any Royals fan at a low price! Wallet contains 4 page plastic insert for pictures, cards, etc. KANSAS CITY ROYALS. MADE BY RICO. THIS NYLON WALLET WITH YOUR FAVORITE TEAM PRINTED ON THE FRONT. We are family owned and operated. One of the owners will be happy to assist you! International Orders. U.S. Orders. My Team Depot Staff. Kansas City Royals. This is a great item for any Royals fan at a low price! · Emblems can be applied to vehicle or any other hard surface with a special automotive adhesive foam 3M tape (included on emblem). · Emblem is 3 ½ " x 2 ¼ " size. Perfect for the car, truck, SUV, Van, Bike, Fridge or Freezer or ANYWHERE to show your support of your Favorite Team! Standard size fits most vehicles. Makes a great gift. Kansas City on Top and Royals on Bottom. Kansas City Royals. See all pictures for details. This is a great item for any Royals fan at a low price! Leather Trifold Wallet. Kansas City Royals. (Buying more than one wallet?. The features of the wallet include Traditional center section for holding paper money with a leather divider. ). Looks great on your vehicle or hanging on your wall. This is a great item for any Royals fan at a low price! Leather Bifold Wallet. Kansas City Royals. (Buying more than one wallet?. The features of the wallet include Made of a very soft leather. ).